Who doesn’t love the idea of opening the sliding doors and exit to a beautiful wood deck? But having an attached outdoor decking is not always a great idea. That’s where the freestanding decks come to the rescue. But wait a minute! Aren’t freestanding decks the ones we see further away from the home structure? How can they stand right outside our living room sliding door if they free-stand? Well, that’s the marvel of deck building today and here we are going to explain the differences between detached vs attached decks and why freestanding options are the best. As their names imply, attached decks are just a step away from your home. They are attached to the house while their counterparts are not. Freestanding decks are those we often see in gardens and around pools. They often become the solid floor of wooden gazebos. They can form paths, create beautiful dining spots in the middle of the landscape, and serve as a platform under trees. On the other hand, no one can deny the convenience of having a deck right outside the door. It takes the place of a porch and provides easy and fast access to all family members. You don’t have to worry about the kids playing outdoors or have to carry trays with dishes back and forth if your deck stands right out of the kitchen and under your beautiful wooden pergola. 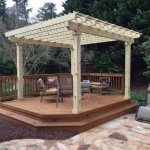 The drawback of attached decks makes freestanding structures a better option. The problem with attached decks is that they highly rely on the home structure. The home holds half of the deck’s weight. Now, if you add the weight of the garden furniture, the people standing on the deck, and the vibrations created due to foot traffic, the burden to the home’s structure is higher. You see, when deck builders install attached structures, they actually support one side to the house while the outer side is supported with columns and beams. This is often bad news for the stability of the house. The deck puts additional weight to the home. And this is not the only problem. Sometimes, a deck builder cannot attach a deck to the existing home structure. That happens when it overhangs or is built with irregular fieldstone. And here’s where freestanding decks come to save the situation. The disadvantage of attached decks now becomes the advantage of freestanding decks. 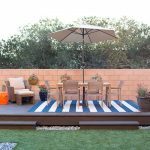 Although they are known for being completely detached from the house and thus placed somewhere in the backyard, freestanding decks can play the role of the right-out-of-the-door deck without being attached. The freestanding deck construction is different. Although their outer side is still supported with beams and columns, there are additional beams and columns on the inner side. And so the structure doesn’t add extra weight to the house. It touches it without attaching to it, if you will. In other words, it is self-supporting. Deck companies do not recommend freestanding structures only when solid attachment is either dangerous or not possible. The benefits of freestanding decks are plenty. No permits are usually necessary for decks not attached to the dwelling. No burden is added to the home structure and foundations. There are no challenges when it comes to fastening the deck to the house because it is self-supported. You can still get your favorite cedar or ipe deck even if you have a two-level home. You can order custom decks of any style and size. It’s easier to replace a freestanding deck. The downside of freestanding decks is the cost. The extra supporting elements kick the price higher. And it’s not just that. The quality of the deck building is of the essence since stability can become an issue. Since this is a self-supporting structure, it might slant, sway or collapse without the right bracing system. It is critical to have very strong footing and bracing. On top of that, you need to make sure that flashing is installed correctly so that you won’t deal with water damage and thus rotting and mold growth. But if you pay attention to such factors and don’t mind the extra buck, freestanding decks are a much better choice than the standard attached decks.